We have the largest selection of therapy mats available in the world. This gives you the largest selection but also can make it difficult to make a decision of which one you need. We have created a simple guide to help make the right decision. You can shop for your specific mat under Healthy Wave Mats menu. What Size of Mat do You Want? The first thing to consider is what size of mat you want. We recommend the full sized mats as they allow the average person to lay their entire body on them. "Shop Mats By Size"
Small (20”x20”) – Small mats are best used as far infrared seat or foot warmers. Ideal for anyone who regularly sits in a chair. Medium (32”x20”) – Medium mats are big enough that you can lay a portion of your body on them such as your back or legs. The soft styles are flexible enough that they can wrap around your body, ideal for localized spot application. Select mats marked PEMF contain pulsed electromagnetic field therapy. Medium-Large (60”x24”) - Medium large mats are long to lie down on and cover the majority of your body. Most individuals will not get leg coverage when lying down. This size was designed so those on a budget can still experience our top lines such as the 5 therapy and 4 therapy mats. Select mats marked PEMF contain pulsed electromagnetic field therapy. Full Sized (72”x24”) - The standard size to provide full coverage to most individuals when lying down. Comes in almost every combination of crystals and technologies we offer. Select mats marked PEMF contain pulsed electromagnetic field therapy. Large(76”x32”+) - Longer and wider; best for the larger and/or taller individual to provide full body coverage. Select mats marked PEMF contain pulsed electromagnetic field therapy. Queen & King sized (80”x60”+) – Our largest size of mats, designed to fit queen and king sized beds. Large enough for 2 people and the best mat size if you want to use your mat on the bed. Select mats marked PEMF contain pulsed electromagnetic field therapy. Which Crystals do you prefer? Our mats are made of 4 main types of crystals: Amethyst, Jade, Tourmaline and Obsidian. Each crystal has different subtle energetic characteristics. You can read about the properties of each crystal under the "Learn - Crystals" section to see if you have an affinity to any particular crystal. If you really prefer one crystal over the others you should consider getting a mat just made of that crystal, otherwise we have many mats which use all of the crystals so you can receive all their benefits. All crystals provide the similar type of far infrared heat; the energetic differences are very subtle and there is no best crystal or wrong choice if you are having trouble deciding. You can shop our mats by crystal combinations under "Healthy Wave Mats - Mats By Crystal Type"
Do you want a soft/flexible mat or regular mat? There are 3 different flexibilities of mats. Soft Mats – Soft mats are very flexible and can be easily wrapped around or rolled up. They have no stiffness to them at all. They are excellent for wrapping around and forming to the body. They can also be used on couches or chairs so form into the seat. Regular Mats – Have some stiffness to keep their shape with some bendability. They are designed to be folded up for storage and are best used on flat surfaces such as the floor or bed. The majority of our mats fall into this category unless it is deemed soft or the PEMF stiff mats. 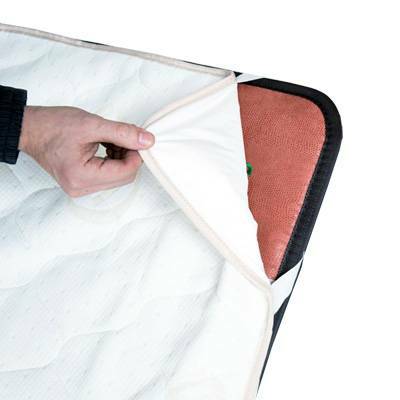 Stiff Mats– Only PEMF mats are stiff as the components inside cannot be bent. They also fold up for storage. They need to be used on a hard surface. Do you want a specialty use mat? We have various mats designed for specific purposes that are made to wear or put on specific areas of the body or can be used in specific situations. You can browse the different specialty mats under the "Healthy Wave Mats - Specailty Mats" section. Car & Chair Mats - for driving and chair mat for the office etc. Pillows & Neck Pillow Supports – For targeting the neck & head area. Knee Wraps – designed to easily stay on your knees while sitting or lying down. Belts – target the lower back and core, can be worn higher or lower on the body to target specific areas. Shoulder/ Back Vests – Targets the shoulders, chest and upper back. Can be worn while sitting or lying down. Do you want PEMF Therapy? PEMF is a unique technology found in only select mats. You can read about the benefits of PEMF Therapy under the "Learn - Pulsed Electro Magnetic Field (PEMF) Therapy" section. All PEMF mats are stiff and cannot be bent! They are meant to be used on a flat surface. You can browse the different PEMF mats under the "Healthy Wave Mats - Mats By Technology" section. Do you want Photon Therapy? Photon Therapy is a unique technology found in only select mats. You can read about the benefits of Photon Therapy under the "Learn - Pulsed Electro Magnetic Field (PEMF) Therapy" section. To achieve the optimal benefits of the Photon Therapy the mat LED lights should shine directly on the skin. You can browse the different Photon Therapy mats under the "Healthy Wave Mats - Mats By Technology" section.